I started joining the internationalization programs when I was in my 4th semester. I first joined the iBuddy program where I assisted international students who came on exchange to BINUS University. I enjoyed a lot of benefits from the program. Some of them were making a lot of friends and learning various cultures from different countries. My first buddy was from South Korea. I was very close to him as well as other Korean students that I travelled to Yogyakarta with them. In 2013, there was a scholarship for a short course to Dong-A University in Busan, South Korea. I applied for it and I was really lucky that I got it. 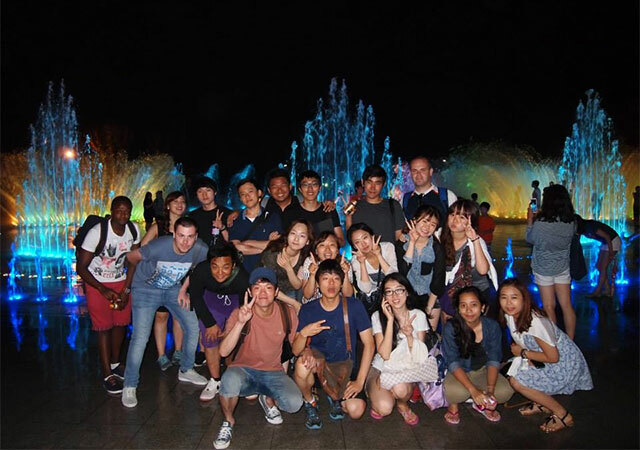 South Korea is a very popular destination to go for exchange or short courses for BINUS students since “Korean fever” has spread throughout Indonesia. It was an amazing three-week program which I enjoyed very much. I also had a chance to visit my friends in Seoul and did some sight-seeing. Seoul and its people are really awesome. Besides being an iBuddy for exchange students, I recently participated in group international internships program with students from Deakin University, Australia. The internship was two weeks long and took place in Luxe Living, a high-end furniture company. I learned so much from the program, such as work ethics and culture, communication skills, managing relationships with people from different backgrounds and cultures. I am anticipating the ASEAN Economic Community (AEC) in 2015 so I am preparing myself to embrace it. By joining the internationalization programs, I hope to gain more skills and knowledge to gain some international experience. There is a quote that says “If there is a will, there is a way.” I hope BINUS students can make the best of any internationalization programs provided by BINUS International Office, as one of the ways to achieve their dreams.